So quintessentially southern it’s known as southern pâté in some circles, pimento cheese is a cornerstone for any accomplished southern cook’s repertoire. 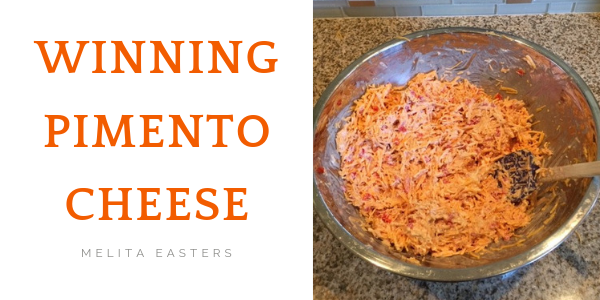 My “WINning Pimento Cheese” recipe has been served at numerous WIN List occasions over the years, including when the founding mothers of WIN List first gathered in my home 20 years ago. Pimento cheese goes highbrow served as crustless triangular white bread sandwiches on silver platters at those southern rites of passage: christenings, weddings, funerals, and SEC or ACC tailgates. While sold for a cheap price, the pimento cheese sandwiches at The Master’s golf tournament each spring in Augusta are revered in tournament memories. On the other side of the tracks, Elvis ate his pimento cheese on burgers. Lewis Grizzard wrote longingly of the No Name Bar along the train tracks in Willacoochee, Georgia where pimento cheese sandwiches were served with Vienna sausages and cold, long-neck beers. At The Varsity in Atlanta, you can get both a pimento cheese sandwich and pimento cheese on your hot dog. Pimento cheese sandwiches are also stuffed into many a hunting jacket pocket next to a flask of bourbon destined for a deer stand. They appeal to young and old alike, as a staple of school sack lunches or served with spiced punch after lectures at the south’s finest senior retirement communities. Pimento cheese is on the menu of many a southern restaurant and catering company – sandwiches of course, but also as a spread, piped on celery and even in deep-fried balls served with spicy tomato/pepper relish. Some southern cookbooks have as many as five versions of pimento cheese and one new book includes only pimento cheese recipes. 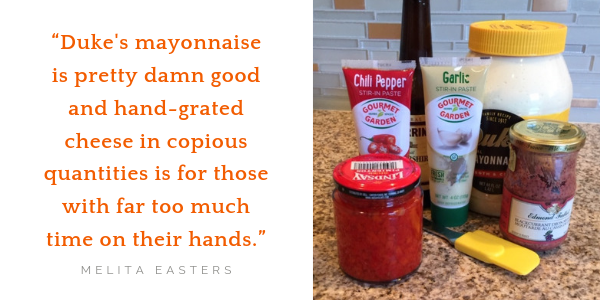 The pimento cheese purists amongst recipe writers begin with “first make the mayonnaise.” Others call for cheese “grated by hand.” To that, I say, Duke’s mayonnaise is pretty damn good and hand-grated cheese in copious quantities is for those with far too much time on their hands. Using the food processor for grating “hoop” cheese is just fine. So are bags of pre-grated cheese sold at the supermarket. However, you should always mix pimento cheese by hand, never in a food processor or with an electric mixer. Mechanical intervention creates pimento cheese with the same texture as the highly preserved stuff sold in tubs on the supermarket shelf. The texture of home-made and hand-stirred pimento cheese is part of its charm. Besides, it’s just too quick and easy to make pimento cheese “from scratch” than to settle for store-bought. If you buy pre-grated bags, buy one bag of the fine grate and another more coarse. More mayonnaise and room temperature butter for spreading if making sandwiches. In a large bowl, combine the mayonnaise, the 3 TBSP of liquid reserved from pimentos jar, and all other ingredients EXCEPT for cheese and pimentos. Whisk well. Add cheese and well-drained pimentos and mix using a large spatula. If necessary, add more mayonnaise for proper consistency. Best when stored for at least 12 hours in an airtight container in the refrigerator to allow flavors to mingle. Bring pimento cheese to room temperature prior to making sandwiches or serving as a spread/dip. When making sandwiches, some spread a thin layer of unsalted butter and then a thin layer of mayonnaise on each slice of bread before spreading the pimento cheese. I do not follow this practice. However, if making tea sandwiches several hours or even a day ahead, the thin layer of butter prevents soggy sandwiches. When preparing sandwiches ahead, separate layers with wax paper and store in zip-lock bags or air-tight containers in the refrigerator. While Velveeta and cream cheese have a place in the Southern food lexicon, they do not belong in pimento cheese. There are those who disagree and they have a right to their opinion of course. When using pre-grated cheese from the store, you should get a mix of fine and coarse grated cheese. For variety, the four-cheese Mexican blend of cheese works wonderfully well. To accompany an Italian meal, use one pound of hard Italian cheeses with one pound of mozzarella. You can also use one pound of a mixed pre-grated Italian blend cheese. For a St. Patrick’s Day treat, grate a blend of Irish cheeses, with white cheddar being especially delicious. For a smokier flavor, substitute a grated smoked hard cheese such as those sold at Trader Joe’s. Also, reduce or eliminate, depending upon taste, the paprika and the Worcestershire sauce. To make it more “hot,” add more pepper blend or Tabasco, but remember a little goes a long way when it comes to Tabasco. 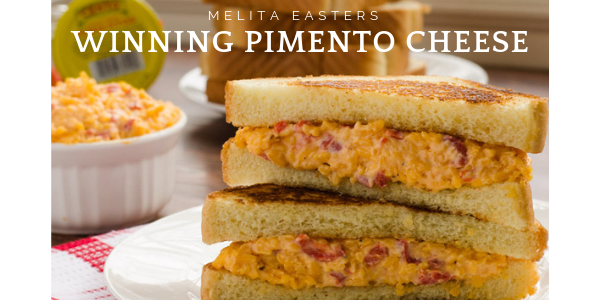 You can make “WINning Pimento Cheese” sandwiches with white bread or any other bread of choice. Experiment with local artisan bakery bread, with Jalapeno cheese or sundried tomato varieties being particularly good. For a tea party or special occasion presentation, use white bread and remove crusts before cutting into rectangles or triangles – two for hearty occasions such as a child’s party and four for high tea. Serve grilled pimento cheese sandwiches with tomato soup or a salad. If using a panini press, spray the bread with Pam to rack up fewer calories than dipping bread in melted butter. Slices of ham or bacon, thinly sliced Vidalia onions or slices of heirloom tomatoes are favorite additions to pimento cheese sandwiches. For a real laidback Southern touch, make a “WINning Pimento Cheese” sandwich with fried spam or bologna in a cast iron skillet. Pimento cheese pairs well with crackers, thinly sliced bread rounds, or toasted bread rounds like those sold at Fresh Market. Thinly sliced pretzel bread is a special treat. Toast pimento cheese on bread rounds until bubbly and serve hot as an appetizer or with soup.